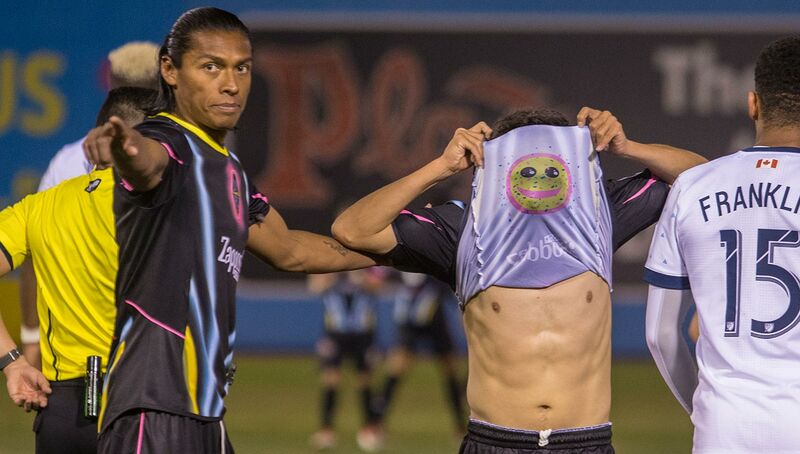 With flashy kits, unique promotions, and a strong fanbase, the Las Vegas Lights have become one of the most compelling attractions in both the USL Championship and Sin City itself. 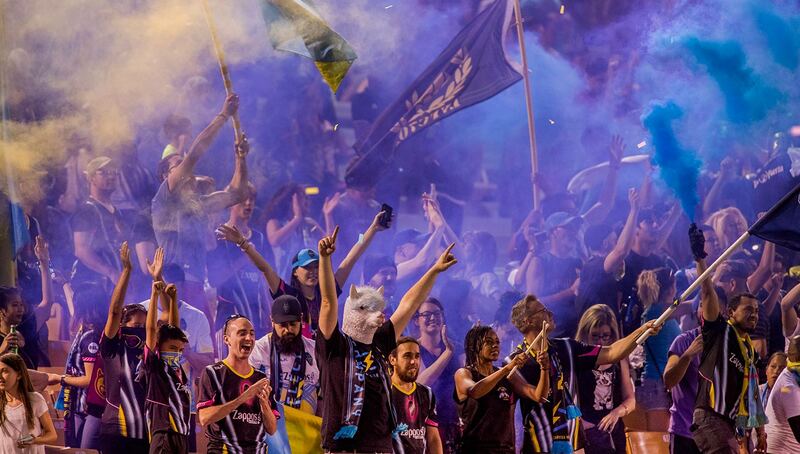 We take a look back at the club’s wild inaugural season as well as its bright future. In 2018, Las Vegas — a city which some call the entertainment capital of the world — received a new show unlike any other in town. 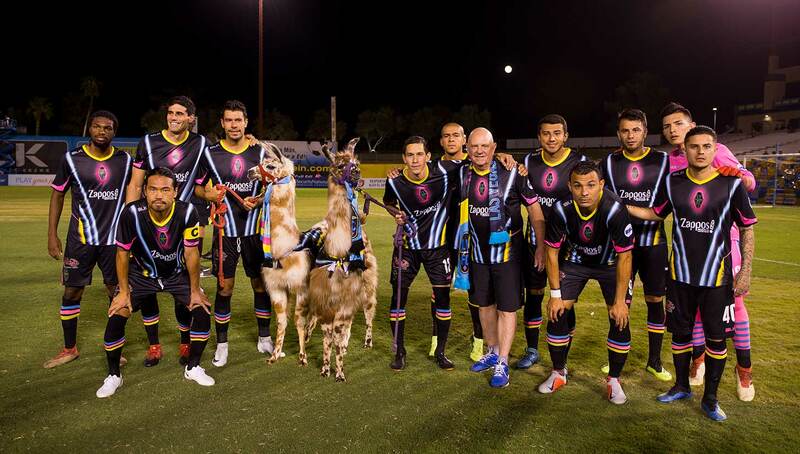 The Las Vegas Lights have introduced the beautiful game to Sin City, while also adding flair and pizzazz to the sport like only a team from Vegas could. 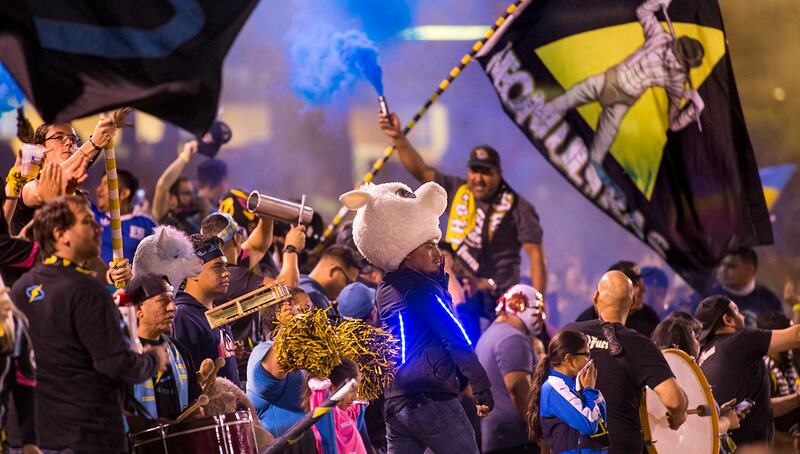 Joining the USL (Now known as USL Championship) in its inaugural season, the club has been able to generate a buzz big enough so that we can safely say that they will be lighting Vegas up for a long time coming. Along with the Golden Knights of the NHL — who made the Stanley Cup finals in their debut season — and the NFL’s Raiders — who are set to depart from Oakland in 2020 — Las Vegas is on the verge of becoming a certified sports town. At the very heart of that transformation are the Lights. It’s not a city you would necessarily think of as starving for sports — Las Vegas has the reputation as being a great place for…other things. Generally, for teams to be successful in this country they often have to embody their city’s personality. They have to represent the fans. They have to put on for their city. What would that mean or look like for Las Vegas? Well as it turns out it’s not as wild as you would think — there’s a whole lot of normalcy and civility in Las Vegas away from the bright lights and delirium of the Strip. Las Vegas is a big city and in big cities you get pockets of crazy but also pockets of people just trying to live their lives. 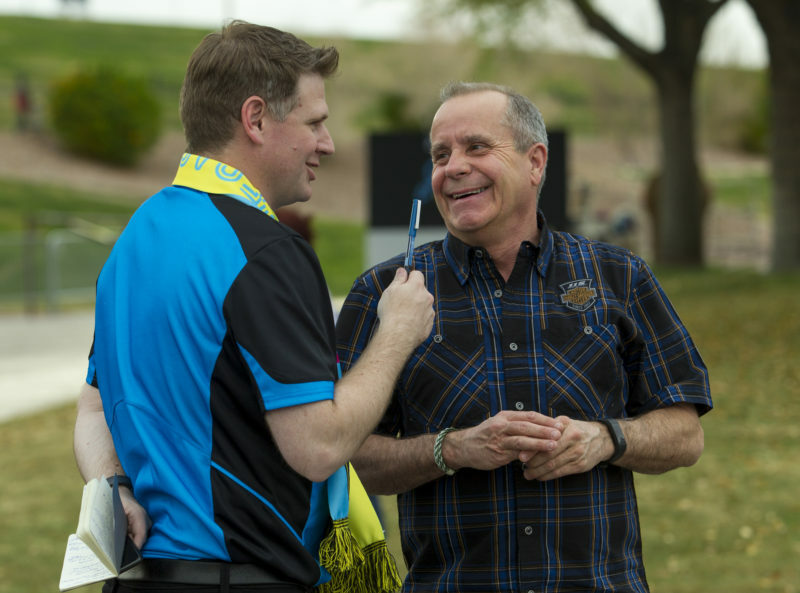 With a population over 600,000, Las Vegas was one of the largest cities in the world to not have a professional soccer team, and owner Brett Lashbrook sought to fill that void. Lashbrook had worked in professional soccer for over 20 years in a variety of roles such as legal counsel for MLS and COO for Orlando City when they were still in the USL. 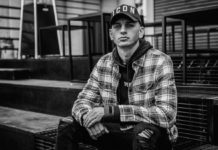 He was brought back to Las Vegas because of a health scare to his mother, and after her health improved, Lashbrook had taken to the city and didn’t want to leave. He started to look into ways to bring a team to where he was. 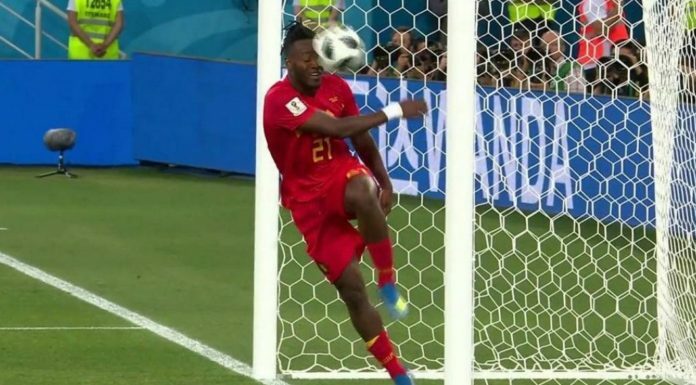 And he did so at the right time when the city seemed to be looking to live sports as another form of entertainment for both locals and visitors. Las Vegas Lights owner Brett Lashbrook (right) during a team practice. The first and biggest challenge was to find a stadium to play in. 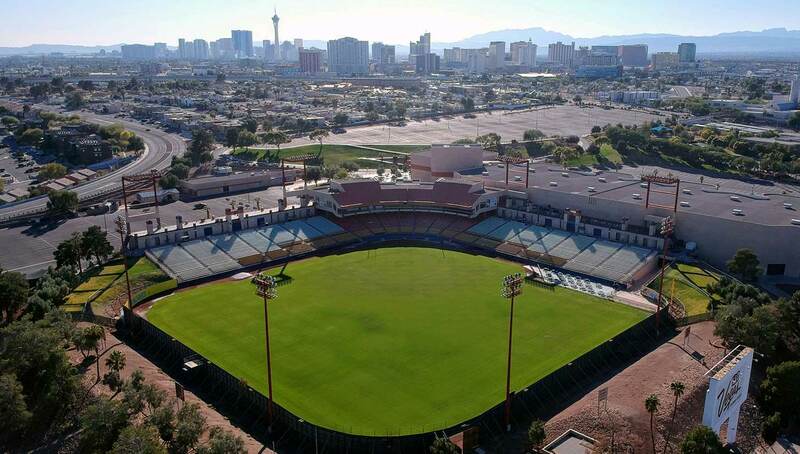 Lashbrook and the Lights decided on Cashman Field, which at the time served as the home of the Las Vegas Area 51s, a minor league baseball team. 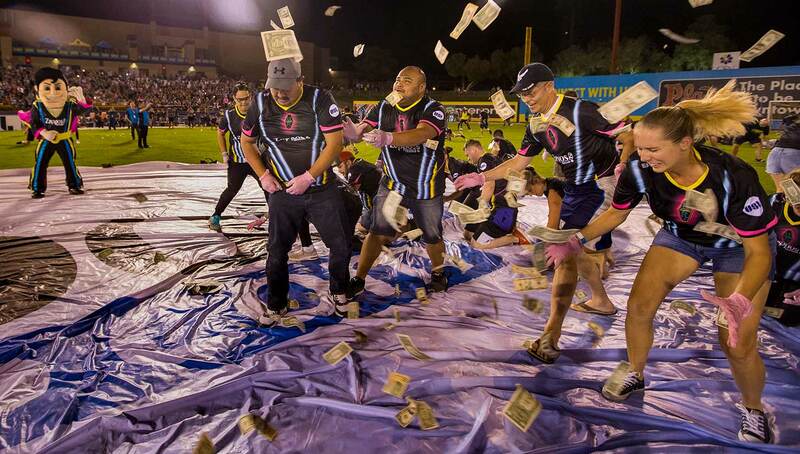 It was the perfect solution, as the rent was low, location was prime, and they would only have to share the facility with the 51s for one season, as the team would be moving out after their season ended in September. 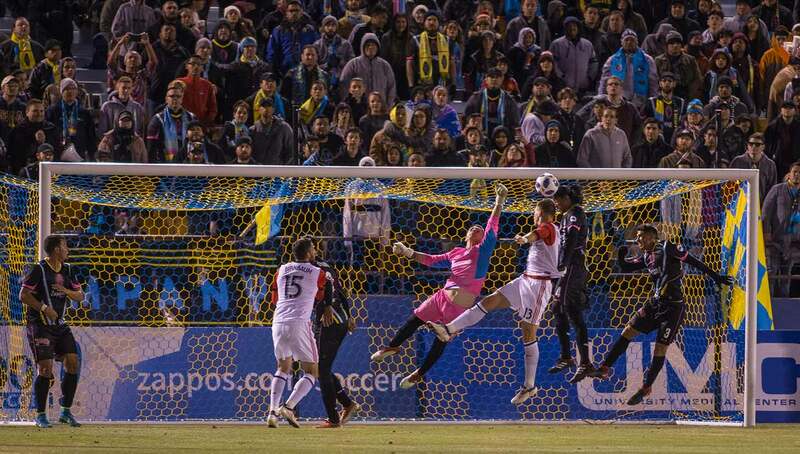 The Lights made an immediate impact on the space by drawing a crowd of 10,383 people to their first game against the Montreal Impact in February, a 2-0 loss. 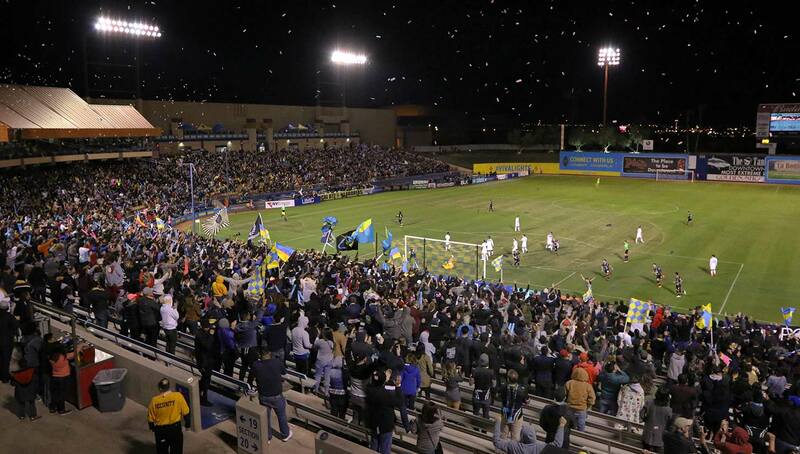 Now that Cashman Field is exclusively a soccer stadium, Lashbrook plans to turn it into a 10,000-plus seated venue with stands along three sides of the field. He thinks they can turn it into soccer’s version of Wrigley Field or Fenway Park. The Lights are embracing the city and the city is embracing them back. 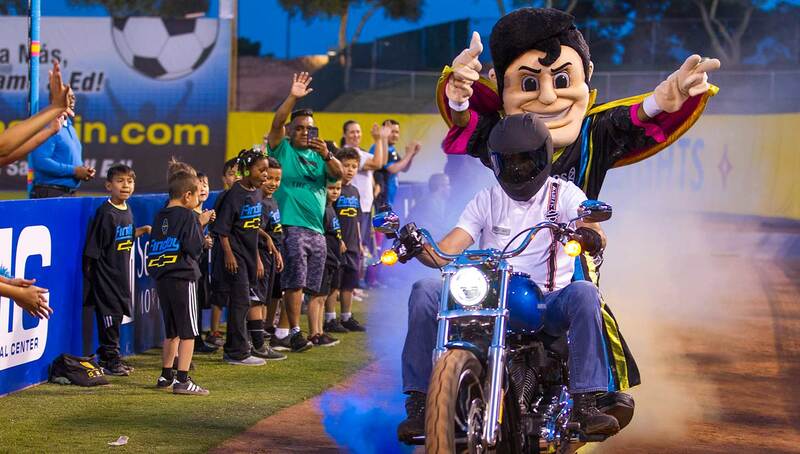 From their exciting game promotions, like a $5,000 cash drop from a helicopter, to the flashy black jerseys with hidden emojis and neon trim, to their real llamas and Elvis impersonator mascot on a Harley Davidson — the show is certainly on at Cashman Field. With their splashy hire this offseason of manager Eric Wynalda, a former U.S. national team player and television commentator for ESPN and FOX, the Lights are clearly going for it in 2019. Last season was a success off the field, but they want to have more success on the field as well. They will continue the whacky promotions, they will continue to innovate, but they also need to continue to score more goals. But it’s not like goals didn’t happen last season. 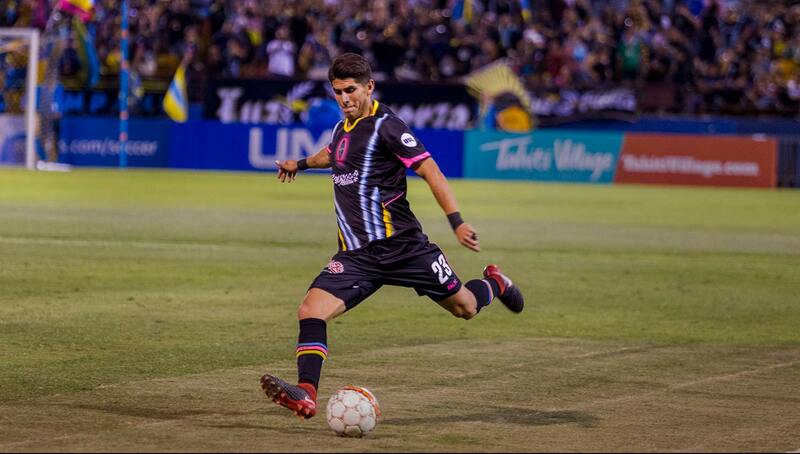 In fact, Sammy Ochoa, the Lights’ second-leading scorer last year with eight goals, just won the USL’s Last Chance Fan Vote Goal of the Year. It was an honor that not only solidified the greatness of his volley but also showed how supportive the Lights fanbase is since it was an award given by fan votes. Ochoa came to the team as a veteran at age 32, and had a very positive experience during the club’s first season. Not all the players on team were veterans, however. 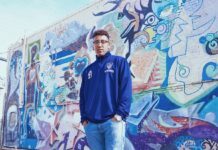 In addition to making big-time signings like Wynalda and Freddy Adu — household names amongst American soccer diehards — the Lights went out into the surrounding community to pluck a crop of young local players to help flesh out the roster. One of them was Angel Alvarez, the backup goalie who just turned 21 and grew up in Las Vegas with no professional soccer team. For him to be able to get an opportunity like this was a dream come true. 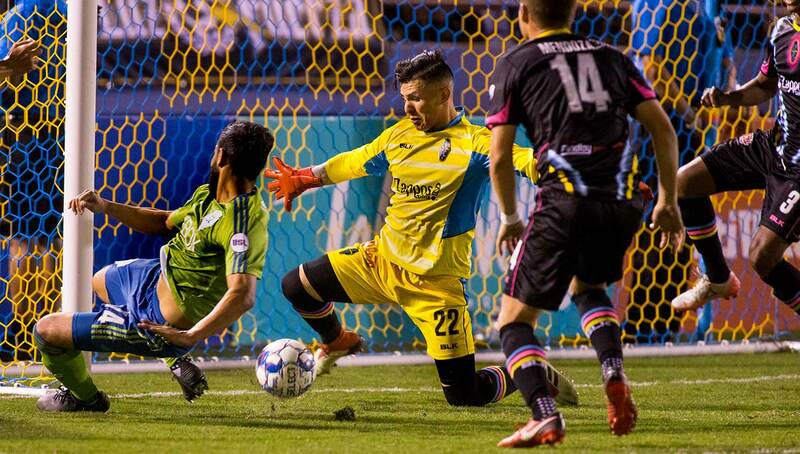 Lights goalkeeper and Las Vegas native Angel Alvarez hopes to become a consistent starter for the 2019 season. Alvarez hopes to crack the starting lineup next year and be a consistent starter, a battle that will play out in the offseason. I got the sense talking to him that he was hungry for more after his first little taste of professional soccer. This is a great sign for the club that they’re able to tap into young local talent, guys that can come in and immediately compete for starting spots on the team. In addition, they haven’t yet fallen victim to any of the craziness that the city is known for. According to Lashbrook, Ochoa, and Alvarez, none of the outside world of Vegas provided a dramatic distraction to the team. The results didn’t happen for them purely from on-the-field issues, not off-the-field distractions. The team seems to be trending in the right direction and they seem ready to get after it again next season. The young players like Alvarez are hungry for more playing time and opportunity. The established players like Ochoa want to maximize their gifts and make this moment count. The new hire of Wynalda is something that will bring even more attention and hype to the club. The owner and management team want to continue to grow and push the ceiling for everyone higher and higher. 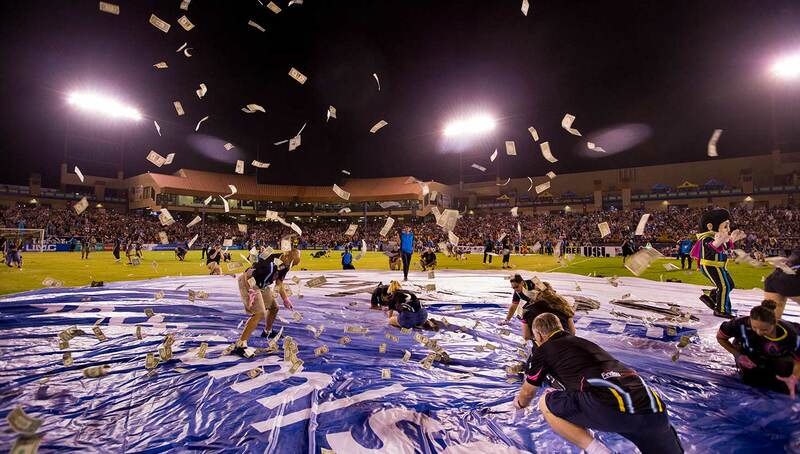 All of the right ingredients are being thrown into the blender in Las Vegas — America’s newest sports town. Photos via Las Vegas Lights.